Thank you to all of you who wished me a long and happy relationship with my new love, the DVR. Honestly, I don’t know how I lived without it before. I have about a gazillion shows already recorded, and it keeps recording more, so catching up is going to be interesting. But I will persevere. I don’t have any new knitting content, so I’m distracting you with pictures from the garden. 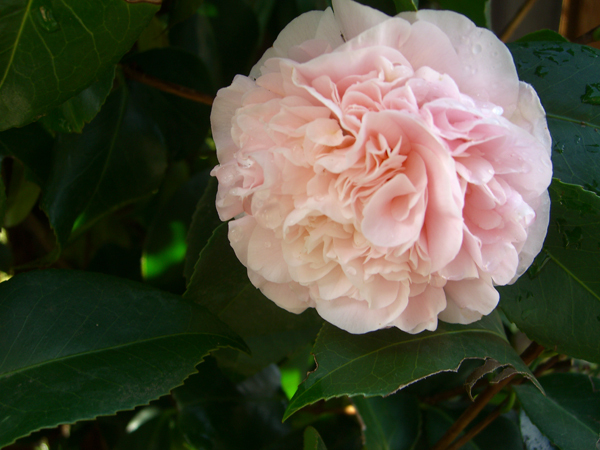 I planted the camellia the first year that I lived here. It’s supposed to be in bloom at Christmas. The first few years it was widely off the mark, blooming any time from March-ish through September-ish. The last several years, though, it’s finally settled down and gotten close to the mark. This bloom was a bud on Christmas, and didn’t actually pop until just after New Year’s, but I appreciate its attempt at making Christmas a little brighter. It will bloom for quite awhile now. I really love looking out my kitchen window on a cold and gloomy January day, and seeing flowers. It makes me smile every time! But this is just crazy! 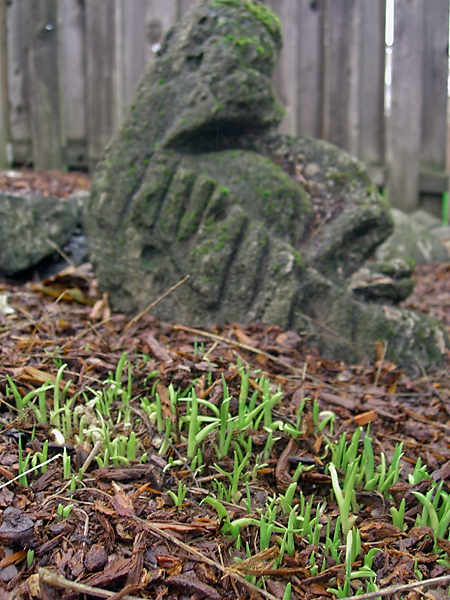 This tiny little green shoots belong to daylilies. It’s going to be several months before they bloom. This is January. It’s been colder than normal here. This week these poor little things have had their heads chilled by freezing fog and then blanketed by snow. They’re not brave, they are foolhardy. I’ve told them to go back to sleep, but they are not listening to me. Perhaps they think they are safe because they are being watched over by Todd The Weather God (named by #1 Son), who is lurking in the background. But I’m not sure that Todd provides much in the way of shelter. Or perhaps they are looking forward to the February faux spring. We shall see what the real spring brings. Tomorrow a group of Seattle knitters are invading Portland and several of the PDX Knit Bloggers are joining in the fun. So if you’re down in the Pearl and see a bevy of knitters marching purposefully down the street, you might want to clear the way. Just remember that we’re after yarn, we have pointy sticks, and we know how to use them.